COROT has provided its first image of a giant planet orbiting another star and the first bit of ‘seismic’ information on a far away, Sun-like star- with unexpected accuracy. 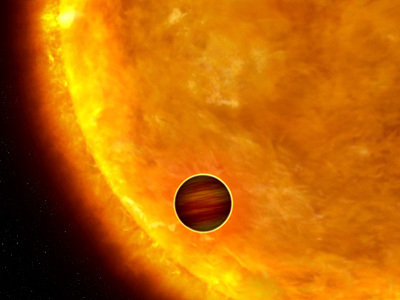 This is an artist’s impression of a Jupiter-sized planet passing in front of its parent star. Such events are called transits. 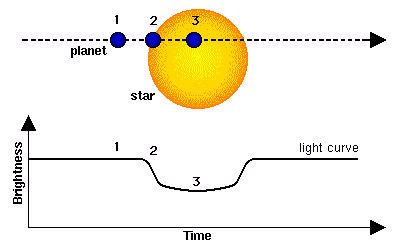 When the planet transits the star, the star’s apparent brightness drops by a few percent for a short period. Through this technique, astronomers can search for planets across the galaxy by measuring periodic changes in a star’s luminosity. The first class of exoplanets found by this technique are the so-called “hot Jupiters,” which are so close to their stars they complete an orbit within days, or even hours.